Petersburg's oldest film festival Message to Man continues to push boundaries, opening with a cannon salute and controversial screenings. 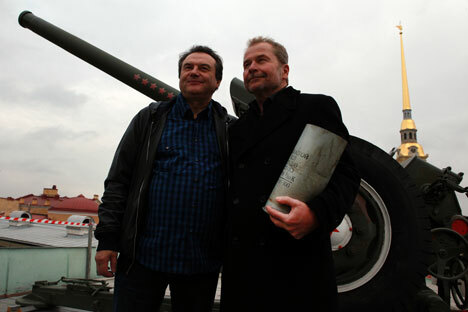 Respected Austrian documentary director Ulrich Seidl was given the rare honor of firing the traditional midday salute from the field gun atop the Naryshkin Bastion at the Peter and Paul Fortress, one of St. Petersburg’s iconic landmarks, to mark the official opening of the 23rd Message to Man International Film Festival. Alexei Uchitel, president of the festival and National Artist of Russia, was also on hand to welcome the Austrian director, one of the official guests of this year's event. Running at venues around St. Petersburg until Sept. 28, this cornucopia of cinema offers audiences more than 200 new films in just eight days, including 50 premières. The festival stands out from other events of its kind in Russia by the sheer diversity of its participants and the films on show: the competition program features a wealth of pictures from 37 countries across the globe, from documentary and animation to experimental films, from feature-length pictures to shorts. Besides this, the festival also brings together esteemed directors and film critics from all over the planet. Seidl's 2003 documentary Jesus, You Know was one of the films screened as part of this year's special program “Into Great Silence,” a selection of films focusing on the lives and purpose of people of faith. In Jesus, You Know, Seidl explores and documents the highly personal experience of prayer and confession. “I don't know what this law is about 'protecting feelings' -I have no idea what this actually means,” said Seidl. American-Indian director Mira Nair (VanityFair, TheNamesake) is heading the jury in the International Competition this year and also presented the Russian première of her 2012 film TheReluctantFundamentalist, the story of a young Pakistani man torn between his corporate career on Wall Street and his native land and culture. Other prominent guests at this year's Message to Man include Russian documentary director Marina Goldovskaya; German director Niko von Glasow, and Turkish director Semih Kaplanoglu, whose film Honey won the Golden Bear at the Berlin Film Festival in 2010. Controversial Russian gallerist Marat Gelman is heading the Experimental jury. Tatyana Kondakova, general director of the festival, lamented that the first few days had been bedeviled by a series of technical problems associated with the festival's move to a new building, but nonetheless said that the reception to this year's festival has been positive, singling out the reactions of the international jury in particular. She stressed that the festival represents a rare opportunity for visitors to see award-winning auteur films on the big screen. “People have a chance here to see incredible films which they will never be able to see at a normal cinema. Films by [Ulrich] Seidl and [Semih] Kaplanoglu – these are beautiful films which everybody should see,” said Kondakova. The Message to Man Film Festival is held with the support of the Ministry of Culture of the Russian Federation, the Government of St. Petersburg, and the St. Petersburg Committee for Culture. It is one of the oldest of its kind in Russia and is not only the country's leading documentary film festival but has become an event of global importance on the world's film festival circuit, and is ranked as a Class A film festival by the FIAPF (the International Federation of Film Producers Associations). Originally begun in 1989 to provide Russia with a forum for documentary cinema, which was witnessing an unprecedented surge in the late Soviet period, the festival has survived numerous difficulties with funding and brushes with controversy, and is now a permanent fixture on the Petersburg cultural calendar. The festival's most scandalous moment came in 2001, when German director Leni Riefenstahl was invited to the city as an official guest of the festival to present her controversial 1935 Nazi propaganda film “Triumph of the Will” as part of the “Documentary Film in Totalitarian Countries” special program. The outcry caused the festival's founder and then-president, Mikhail Litvyakov, to be summoned by city authorities and resulted in the event's funding being cut by 500,000 rubles. The 23rd Message to Man International Film Festival runs until Sept. 28 at the Velikan Park, Lenfilm, Dom Kino, Lendok, and Erarta film theaters in St. Petersburg. The majority of the films are screened with English subtitles. Details are available on the festival's official website.